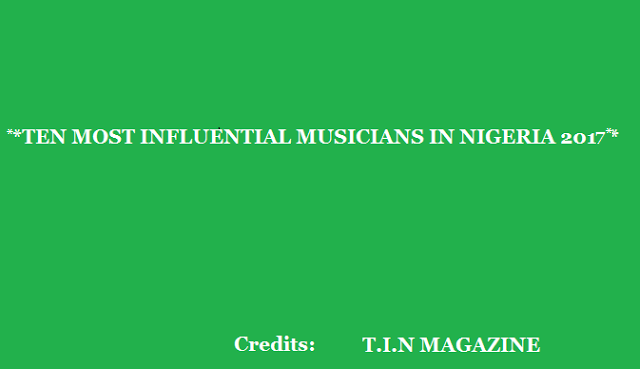 We at T.I.N Magazine are back with our rankings this year this time it is about the most influential artistes of 2017.
fame,money or hit songs a singer has but their influence in someway or the other. After dropping her album months ago she really went to push the music outside Nigeria. She later got signed on to Jay Z’s Roc Nation management which is meant to distribute her music to a larger territory. management. She is also a great philanthropist. fans at his concert earlier this year. producer have made a lot of impact in people’s lives too, we’ve learnt the producer has done quite some charitable works in recent months. did a giveaway helping other artistes financially. and needy people. He deserves to be here. The singer dropped a single “WO” not long ago and it became a hit in a matter of days showing he is still king on the local scene, the singer also gave out 3million naira in the name of the song to 3 dancers. Olamide has shown he’ll still be here for a while. 50shades of influence for the past 12 months. artistes on his starboy ent label are doing fine. He’s also revealed he’s been involved in several charity projects for sometime now. in he music scene called “pon pon”.